The project was designed to undertake research and excavation on enclosures and hillforts in the Lammermuirs as part of the overall Rampart Scotland aims, to provide a corpus of data to compare and contrast with the existing information. The Sheriffside enclosure is located in a silage field, immediately to the north of Sheriffside Farm, Gifford, East Lothian (NT 55505 67739). The enclosure is located on the south eastern edge of a low southwest–northeast ridge. 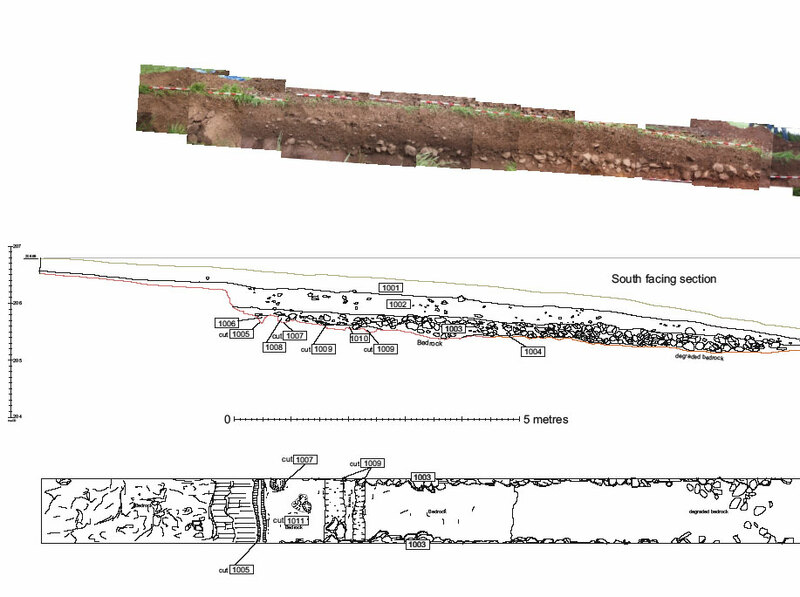 This project aimed to add detail to the existing rectified aerial photograph (first recorded in the 1980s by the RCAHMS ) and to provide an assessment of the nature of the surrounding archaeological remains and a date for it. 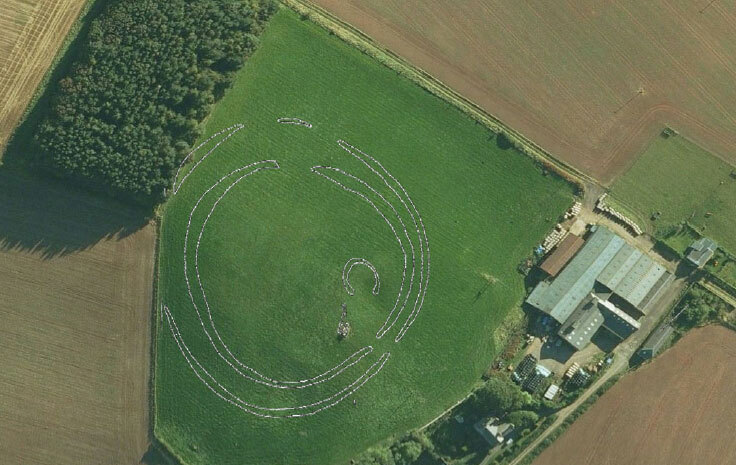 This involved the conducting of a geophysical survey and hand excavation of a single trench (1m by 22m) over what was expected to be the cropmark’s two enclosure ditches to recover dating evidence. The excavations failed to confirm the presence of the putative cropmark enclosure but did identify a terrace with associated platform and cut features such as postholes and rockcut channels – charcoal retrieved from the fill of one of the rock cut features dated to 2030 ± 30 or cal BC 110 – BC 50 (1σ) SUERC 35712. Geophysical plot and location of Trench 1 in relation to transcription. The resistivity survey was undertaken by the Edinburgh Archaeological Field Society using TR/CIA area ground resistance measuring equipment. A total of thirty-one 20 by 20m survey squares were undertaken at the site, although many of the squares were taken on slopes, there were no locations where it was not possible to carry out the survey. 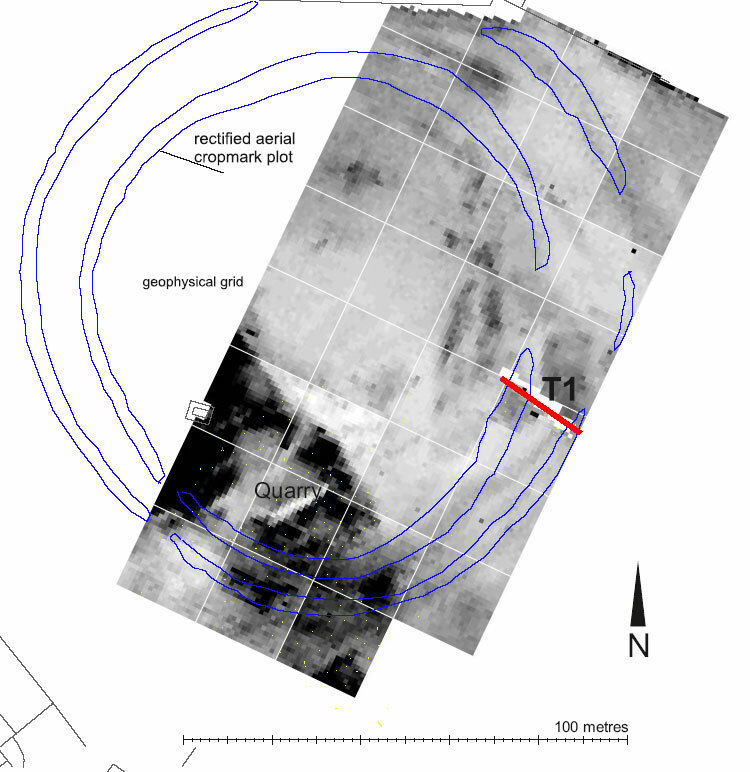 It is clear that the aerial transcription does not seem to match the geophysical results, and the 19th century quarries are visible on the west and south slopes with what seems to be the ditches running through them – either that (impossible as it seems) or the ditches are of such a depth as to be still visible beneath the later quarry entrances. Local volunteers, schoolchildren from three East Lothian schools, adult learning students from Midlothian, University of Edinburgh archaeology students, a group from ‘Dad’s Work’ and the Edinburgh Archaeology Field Society were all present during the excavation and survey. In total, over 215 people were involved on a number of tasks from topographic survey, geophysics and both test pitting and excavation. Training was provided where possible and several 1 hour site tours were conducted, with feedback provided to the Peter Potter Gallery in Haddington(who provided funding for the excavation). Trench 1 measured 22m long by 1m wide and ran north-south perpendicular across the putative inner ditch to beyond the putative outer ditch. However, no trace of either ditch was observed. Below the turf and topsoil was a matrix of hard mild-brown silty clay , with occasional small angular rocks. An undiagnostic small hand thrown prehistoric ceramic sherd was recovered from this layer (pers comm. M Johnson). Underneath  was a layer of compact large angular stones [1003-4], which appeared to form a rough surface. The stones were laid upon a cut terrace , into the hillside  with a number of bedrock cut features. These features consisted of what looks like two post holes [1007, 1011] and three slots running east-west across the excavation trench. It was not possible to determine the size or shape of the structure that the postholes and slots belonged to belonged due to the limited area covered by the test trench, although it is likely to represent some kind of roundhouse. In addition, one of the cuts  was positioned at the back end of the cut platform into the hillside  in such a ways to make an excellent trench to catch water runoff from the hill. As such it is possible that this cut served as a drainage system to keep water from running onto the platform. 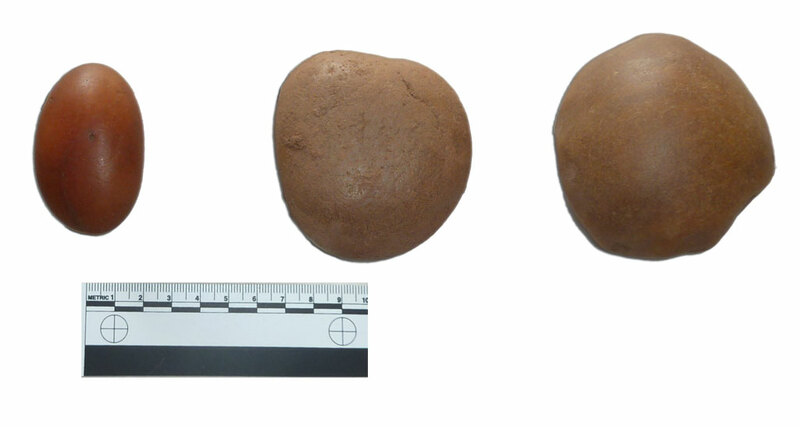 Two polished stones and two hammer stones (pers comm. M Johnson) were recovered from . We would like to thank Eric Glendinning for suggesting the site and allowing access onto his land, the technical support of the Edinburgh Archaeological Field Society with their geophysical expertise; the advice of the East Lothian Council’s archaeological team; and the nearly 200 volunteers of all ages who helped make this possible. The project was made possible by Peter Potter Gallery, Haddington, as part of their Lost Landscapes Programme.